Last status update of the year. Kind of surprising – I’m not as far with this game as I wanted to be, but I’m still really surprised how far I’ve gotten with it. I keep adding to my to-do list for the game, but the list is getting smaller faster than I’m adding things to it, which is a good sign. Hopefully I can get this game done soon and move on to the next. I’m actually looking to prototype something new soon. I did a little testing of my Windows port – it had been a while, so naturally several bugs were introduced. The most obvious issue was that my shadows weren’t working! Minor fix, but it’s working now. Still need to try out the Mac port again. I also started adding a new bonus challenge for the game: Crows! When you collect a black feather, the Crow challenge is activated on the next wave (kind of like the Dog challenge). Basically, a crow will periodically land on the screen. But whoever’s feeding these pigeons doesn’t want to feed crows. So they won’t. No food will drop until you scare the crows away. They are absolutely a work still in progress. Lighting’s not working, they don’t scatter at the end of waves or the game, their AI is a little wonky (which is weird because they should be using the same stupid AI as the pigeons – but I’ve noticed things, like wandering into the corners and getting stuck), and also I want to make the crows a little bigger than the pigeons. I guess these are the things I’ll be working on next week. I had been mostly using old OpenGL transforms throughout the game, which are deprecated, and I finally made the push to switch these out for self-managed matrices using GLM. So that’s nice. It’s not something you can really see from a screenshot or video or even playing the game, but it’ll make development easier (I h0pe). Also, I was using OpenGL display lists. Not anymore. I still need to switch to vertex buffers. In the future, most likely. I think this week I will play around with adding another bonus challenge, and do some testing of my recent changes in Windows and Mac environments. Hopefully soon I can start looking at porting to mobile, which is the main place I want to sell the game. Also still working on a better name for it. Meet you back here next week, and happy holidays for whatever holidays you celebrate! I worked on finishing the code for my UI stack – this will make it easier for me to manage menu screens, and direct input events to their proper place. I played around a little more with lighting, which I’ll probably doing a lot of until the game is done. More importantly, I added shadows to the game! The shadows are far from perfect, so this next week, I hope to fix some of the issues with them. I also plan to do some work on underlying architecture (transforms and stuff), and some other neat stuff. Improved menu interface by making the menu items clickable. This will, of course, become a touch interface later. Working on a UI stack structure for better menu management. Played some more with lighting, made a simple light animation sequence. Started researching adding shadows (nothing to show for it yet except broken code). Definitely some tweaking to do, but I think it’s looking good. …we proceed onward in our quest to get better at posting status updates regularly. Well, it’s been a while. I can’t say I’m surprised how bad I am at posting articles to this dev blog. But it’s a new day and I can try again. Just know that the project, and the company, and me – we’re not dead. Just very busy and forgetful. I revised the underlying sprite logic, specifically the pieces that load spritesheets, but also some of the rendering code. I revised food (and bonus items). The code is a little cleaner now, so when I go to start adding more types of foods to the game, it’ll be less of a hurdle. I continued working on my collision issues. 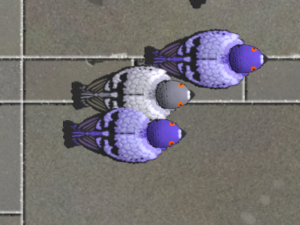 I’m not liking the changes to the bounding geometry at all – and if I’m being honest, I never really had a problem with the collision itself, just the way it rendered when pigeons were close enough to overlap. I also played around with some simple lighting. I’m now able to add a light source to my scene and move it around, and the sprites light up and shade properly. Please do check back next weekend. I will do my very best to post another update. I may even have a name for the game by then (haha one can hope).